A BOOK that tells the gripping story behind a critically acclaimed television character’s fall from grace has scooped New Zealand’s crime writing award for 2012. Wellington-based novelist and screenwriter Neil Cross was announced as the winner of the prestigious Ngaio Marsh Award for Best Crime Novel, for his “unflinching, brutal, and brilliant” book Luther: The Calling, at the conclusion of the lively Great New Zealand Crime Debate event at the Christchurch Writers Festival on Saturday, 1 September. It was a case of third time’s the charm for Cross, the British-born writer who writes his novels, as well as a variety of projects for British and American film and television, from his suburban Wellington home. Previously a finalist for the Ngaio Marsh Award in both 2010 and 2011, he finally got his hands on the distinctive Gina Ferguson-designed and sculpted trophy, which depicts Dame Ngaio’s visage on an open book, following Saturday night’s event. 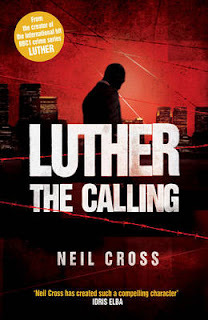 The judging panel, consisting of crime fiction experts - authors, publishers, reviewers, and event organisers - from the United Kingdom, the United States, Germany, and New Zealand, said Luther: The Calling was “outstanding” and “a stand-out novel”. One international judge didn’t think a prequel could possibly stand on its own, but “was very pleasantly surprised”, noting Cross’s “writing, plotting, and voice” was so strong that “he could write a fresh, new book” based on a well-known TV character. Luther: The Calling is “a superbly crafted, brilliant stand-alone novel”, said another judge. Cross creates “such real, credible characters, a complex plot, with brilliant dialogue,” noted another. The Ngaio Marsh Award for Best Crime Novel, established in 2010, is named for Dame Ngaio Marsh, who is renowned worldwide as one of the four Queens of Crime of the Golden Age of Detective Fiction. Dame Ngaio published 32 novels featuring Inspector Roderick Alleyn between 1934 and her death in 1982. With sales in the millions, and her books still in print to this day, Dame Ngaio is one of New Zealand’s most successful authors in history. Dame Ngaio’s closest living relative, John Dacres-Manning, gave his blessing for a New Zealand crime writing award to be named in her honour, saying that “I know Dame Ngaio would be so proud … to know that her name is associated with the award”. In addition to the handcrafted trophy, Cross wins a full set of Dame Ngaio’s novels, courtesy of HarperCollins, and a cheque for $1,000 from the Christchurch Writers Festival Trust. Thanks for posting. Some great additions for my reading list. Neil Cross is always winner of the story..